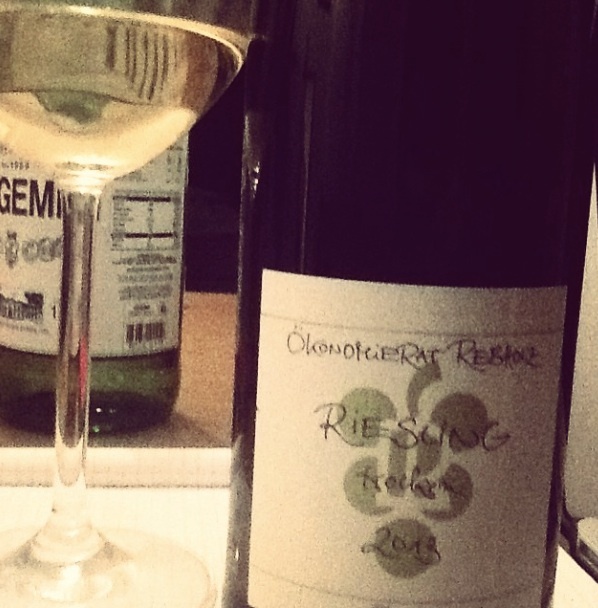 There is something wry and world-weary about dry Pflaz Riesling. The mineral quality is so self-effacing that it would not surprise me if it preferred to keep company with the young and effervescent sparkling mineral waters at the dinner table rather than the serious conversation of the old cellared reds and the over-caked whites. I want to use the word “refreshing” for 2013 Trocken Riesling from Rebholz – the master of the Pfalz – but that term would feel far too energetic and youthful. It reminds me of a very strange party I went to for a 90 year old customer who had never done anything more than polo in Argentina – this wine makes a party out of random people as it stays fascinated in everybody. Sliding up to fancy chicken wings or pretty little nori rolls so it can provide the erudite chat. Not everyone can be devoted to the inconsequential so seriously, so sincerely and for so long. This wine outlasts them all.